$100.00 – provides curriculum and education for one classroom. $250.00 – provides curriculum and education for one grade. $500.00 – provides curriculum and education for two grades. $1,000.00 – provides curriculum and education for an entire school. Jaylens Challenge would not survive without the help and encouragement of its loyal supporters. 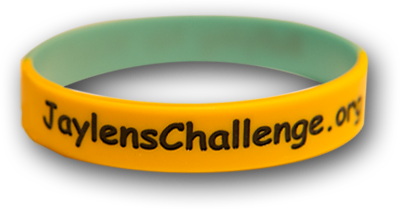 Every donation over $10 is rewarded with an exclusive JCF Glow-in-the-Dark wristband. Please state whether you would like small for Youth or Large for an adult mans size when donating through Paypal. Thank you!